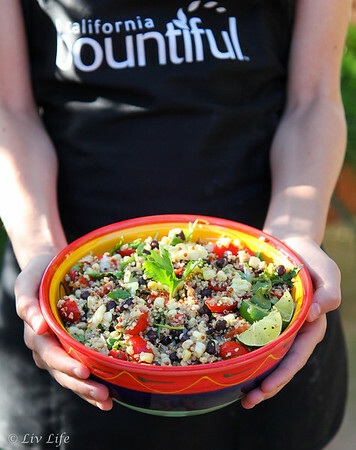 Filled with healthy, energy providing ingredients, this dish works beautifully for lunch or a light dinner. Quintessential Mexican ingredients bring a lovely balance of flavors that only seem to be missing a tart margarita - which in actuality may not be Mexican at all. But that's for another homework assignment. Rinse quinoa, then cook as directed on package. (I usually do 2 cups water to 1 cup quinoa - but check your package.). Allow to cool. Preheat grill on high. 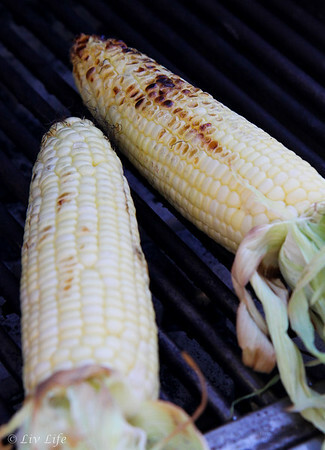 While grill is preheating, remove husks and silks from the corn. Set aside. Slice sides off of pepper and remove seeds. Rub oil over pepper slices and jalapeño. Place corn and peppers directly on grill and reduce heat to medium/medium high. Turn corn and flip pepper pieces every few minutes until they have nice char marks and the peppers are soft and the corn is cooked, but not soft. Remove from grill and allow to cool. Alternatively, use jarred red peppers if you don't want to grill your peppers. 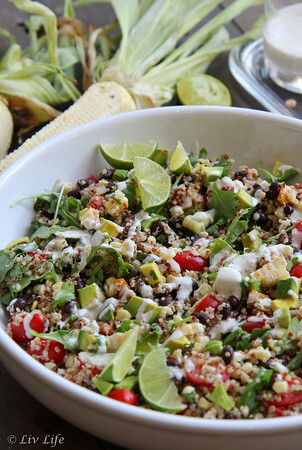 Place cooled quinoa, tomatoes, beans, and onion into a bowl and toss gently to mix. Slice corn off of the cob and add to the bowl. Chop the pepper and add to the bowl. Chop and seed the jalapeño and add as much as desired depending on your spice tolerance. Stir gently again to combine. 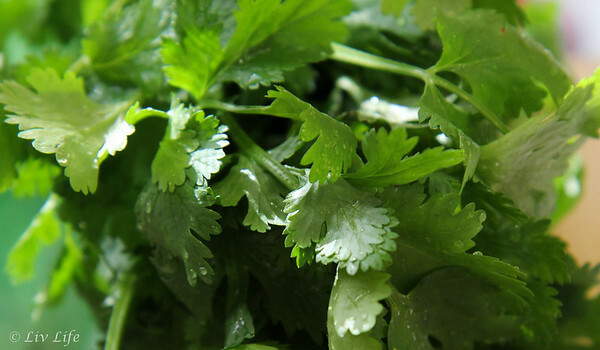 Pour the lime juice and olive oil over the salad, then add the cilantro and arugula (or alternatively, serve the salad over a bed of oiled arugula), stir to combine. Add salt and pepper to taste. Salad is ready now, but I prefer mine a few hours later and chilled. Serve in individual bowls and top with a drizzle of Coconut Lime Cashew Crema along with a garnish of lime wedges and additional cilantro. I love everything about this dish! 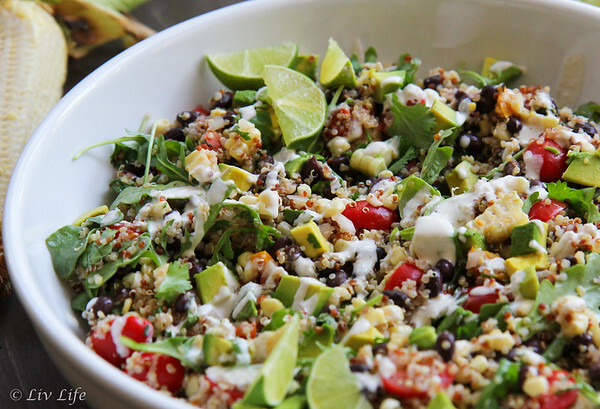 We've made a Mexican Quinoa before, but it was different so I'm definitely going to try your recipe! Avocados have a special place in my heart too, love them. Interesting to hear where all of the ingredients originated from! We did too!! And the fact that my Liv loved it as much as I did was a bonus. She's already planning on taking it to school for lunch to make her friends envious! This is my kind of dish! It looks sooo good! And that crema...omg! Oh, this looks really filling, healthy and delicious!! 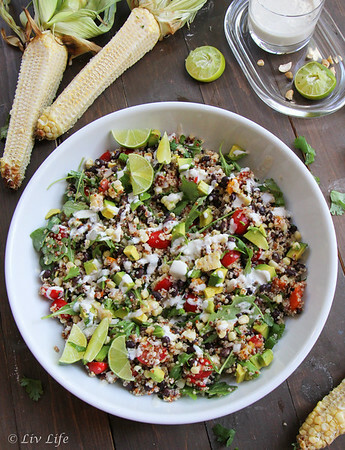 What a creative way to enjoy quinoa...I bet the grilled corn adds a beautiful sweet flavor to the salad. 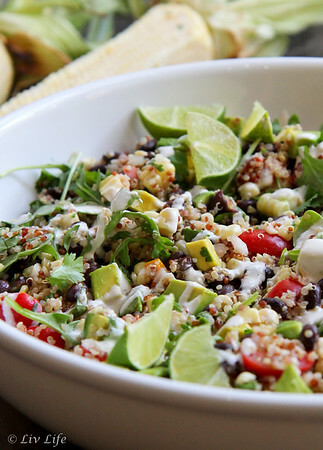 I love the ingredients in this Mexican quinoa! Sounds super tasty!! I have to make this! Seriously, it's so up my street I can't believe it. I almost passed but then I saw it was cashew crema...aha! I enjoyed the Mexican ingredient history too. Viva cilantro!